Educational Qualification : M.D in Homeopathy form a recognized Board/Council/ university included in the Second Schedule to Homeopathy Central Council Act, 1973. CCRH Selection Process : Selection will be based on Written Test & Interview. Application Fee : Candidates have to pay Rs.1000/- for General/OBC through Demand Draft in favour of Director, CCRH payable at New Delhi. SC/ST/Women/PWD candidates are exempted from payment of application fee. How to Apply CCRH Vacancy : Interested Candidates may apply in prescribed application form along with self-attested copy of relevant Certificates & documents & DD send to the Director General, Central Council for Research in Homoeopathy, 61-65, Institutional Area,Opposite D-Block, Janakpuri, New Delhi – 110058 on or before 05.02.2018. 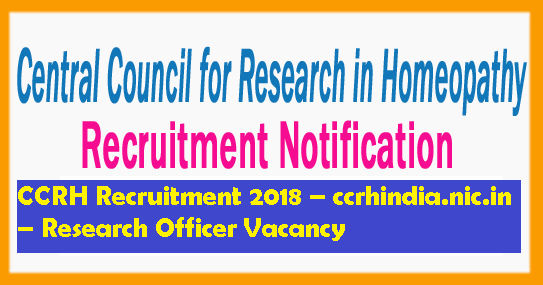 Central Council For Research in Homeopathy invites application for the post of 08 Research Officer (Homeopathy) in the units/institutes of the central council for Research in Homeopathy located in the North- Eastern states.